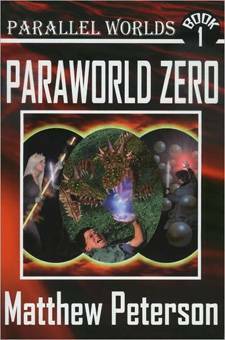 9/22/2010 UPDATE: Paraworld Zero has been published in India! Check out the new cover. 7/14/2010 UPDATE: After waiting a full year, we're finally back in our home that was destroyed in a fire. What a relief! Check out my online radio show The Author Hour: Your Guide to Fantastic Fiction. Some of my international best-selling guests include Dean Koontz, Christopher Paolini, Anne Rice, Terry Pratchett, R. L. Stine, Meg Cabot, Diana Gabaldon, Terry Brooks, and L. J. Smith. Also, take a look at my latest interview on TeensReadToo. NEW! 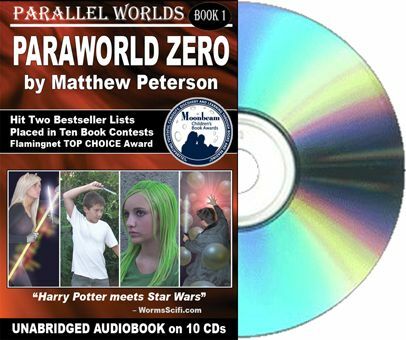 The 10-CD audiobook has just been released. Great for schools and libraries. Special: Get the MP3 audiobook for 50 to 67% off! Click Here for details. Twelve-year-old earthling, Simon Kent, stumbles upon a secret that thrusts him into a bizarre adventure filled with magic, technology and deadly out-of-this-world creatures. He discovers a true friend, confronts his inner demons and becomes the savior to a peculiar race of people, when all he truly wants is to find his way back home. Audiobook: 12.5 hours, 2 narrators, and 100 voices! & hundreds of MP3 devices. Simon Kent is just an ordinary teenager trying to cope with the loss of his parents and the bullies at the local high school . . . or so he thinks. After meeting an outspoken girl with strange hair that changes colors with her mood, he is swept into a futuristic world filled with dragonlike creatures, vast technology, and enslaved giants. But Simon also stumbles upon a secret: He can perform magic in this parallel world! While fighting mystical creatures, unraveling an ancient mystery, and even experiencing his first kiss, Simon discovers that he, an outsider from Earth, is the only person who can save the high-tech planet from an impending doom. - Finished Writing Book 2! - Haruah publishes "Letting Go"
- Coincidence or Devine Intervention? - Am I Black or White? - Too Tired to Think! Matthew exhibited at the 2008 BookExpo America in Los Angeles (booth #5741), the 2008 Public Library Association Conference in Minneapolis (booth #1326), the 2008 Los Angeles Times Festival of Books (booth #929), and the New York Book Festival. He is also participating in several fantasy/science fiction conventions including WorldCon, Nebulas, CopperCon, TusCon and the World Fantasy Convention. View Matthew's full schedule and announcements here. Click Here to see our $150,000 marketing plans. Includes ads in The New York Times, Publishers Weekly, The Bloomsbury Review, etc. Windstorm lost the rights. I'm seeking a new publisher! Basic Audiobook MP3-CD (128 bitrate): $29.95. Bookstores, schools, libraries & clubs can contact us directly for special discounts on large orders. Matt does a lot of speaking engagements as well. Just ask. Matthew Peterson donates around 13% of his gross earnings to charitable organizations, some of which help clothe and feed the needy.